Ethiopian, Kenyan and Ugandan coffee farmers are suffering from low coffee prices hence they cannot make ends meet. The only options they have remaining are alternative crops or having the prices increase to keep them producing the cherries. Globally, coffee prices are at their lowest in 13 years making the farmers feel the heat since their investments cannot be recouped. Ethiopia is ranked among Africa's poorest nations with half of its 77 million people currently living below the poverty line. To produce good quality coffee, Ethiopian farmers grow their finest coffee under the shade of native trees. This practice has been ongoing for decades and it allows the coffee berries to retain moisture until the time for their picking is ready. Coffee cherries in different stages of maturity. If the coffee bushes were grown without the shade, they would produce inferior quality beans which are bitter tasting. Ethiopia is the world's seventh largest coffee producer and this year could transform the nation's fortunes from the commodity if China becomes another of its consumers. The country consumes most of its coffee with the other half being exported to its major markets in the European Union (EU), East Asia and North America. Ethiopia exports to China were valued at USD 88.69 million during 2016, according to the United Nations COMTRADE database on international trade. According to Yirgacheffe Coffee Farmers' Cooperative Union (YCFCU), the traditional Ethiopian coffee cultivation practices are still dominant among the Union's farmers. "Coffee trees are managed by hand and fertilised with organic matter. Pests are controlled by biological, natural methods. Our farmers follow traditional cultivation practices rather than using chemical fertilisers, pesticides and herbicides." While the picture that is painted here is glossy, there are fears that falling coffee prices will leave a lasting mark on Ethiopian coffee farmers since they cannot make ends meet. A Reuters report in October 2017 highlighted the issue of poor coffee prices where farmers could not yet feel the benefits. The report indicted the organizations selling coffee on behalf of Ethiopians saying the benefits of Fair Trade for Ethiopia's small coffee farmers "have not been as significant as may be widely perceived." Despite the increasing upward trajectory of coffee prices in shops, farmers are not seeing the benefits for their toil and hard labour in producing this popular beverage. On Friday, Al Jazeera quoted Tesfaye Dora who is the head of Shebedino Agricultural Bureau saying that if the coffee prices do not improve for the farmers, then they will be forced to seek alternatives. Dora said the farmers would be forced to invest in other crops which would reward their labour. In neighbouring Kenya, most coffee farmers have uprooted their coffee paving way for real estate development which they feel is more rewarding. Last year, a section of farmers in Nyeri were captured uprooting coffee in protest of the sorry state of coffee farming in Kenya. Reports indicated that coffee factories in the larger Mount Kenya region were closing due coffee hawking, increasing debts, mismanagement and low prices offered to farmers. Lack of government support in farming and exporting coffee saw Kenya's coffee earnings drop by Ksh1.3 billion in the six months to March 2018 in comparison to a similar period previously. Exploitation by middlemen has seen farmers shying off from the produce and the effect of this was decreased coffee at the Nairobi Coffee Exchange (NCE) auction. In 2017, for instance, the auction recorded 31 million kg as at August which was 4 million bags less sold over a similar window the previous year. In March 2018, the Kiambu banned uprooting of coffee by farmers saying the ban is aimed at protecting the crop. The Deputy Governor, Dr James Nyoro, said there is a task force mandated with interrogating issues ailing the coffee sector. The Agricultural Economist added that the taskforce is expected to recommend solutions that will revive the ailing sector. "We have the potential of producing four times what we are producing today, but there are several problems. By the end of 2018, instead of a tree producing one kilogram of cherry, it would probably produce five kilograms or more," Nyoro said. And the poor performance is not affecting Kenya and Ethiopia only but Uganda has it share of problems as well. Coffee growers in Uganda have been hoarding their stock until global prices improve. Global prices have continually been on a decline with the International Coffee Organisation (ICO) saying coffee prices for all coffee groups fell in June 2018. 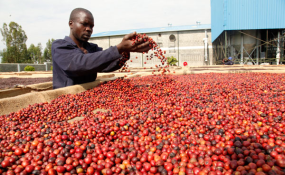 In Uganda, low coffee prices have been eating into farmers' pockets. This is forcing the producers to hold onto their produce in the hope that prices will get better.